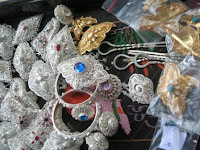 Celuk is a tourist village craft gold and perak.di Bali. As a tourist attraction, Celuk can be visited every day for a close look at the artists who are creative makes gold and silver jewelry of high quality. Celuk Village is located in the village of Sukawati, Gianyar regency, Bali. The location is very strategic in tourism route Batubulan - Sukawati.